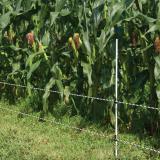 Excellent for both permanent and portable fence situations because PE (polyethylene) filaments resist wear and abrasion. Identical to IntelliRope® PE 4.5 except it has more polyethylene (PE) monofilaments. Use for horses, cattle, sheep and goats. Can be pre-wound onto an EzeReel XL (Spool Only) or EzeReel XL (Complete). Excellent built-in elasticity. Particularly suited for humid climates because mildew does not "thrive" on PE. Approximate cost per ft 9¢. 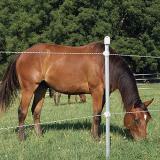 Permanent Rope Fence: If posts are power-driven, only a battery drill, cutters and screwdriver are needed. We do 500 ft in 2 hours if posts are already in place. Install wood end, corner and line posts. Attach rope to one end. Clip rope into insulators. Pull until the P Spring is 50% compressed. Terminate it. 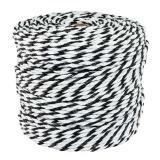 Connect ropes together electrically at one end with a piece of insulated wire. Install and connect the energizer. Voltage should be over 1500V. Note: If run is 1000' feet or longer, use a P Spring at both ends of the fence instead of 1 end. 5 strands—60", 48", 36", 24", 12"
5 strands—36", 27", 20", 13", 7"
If cutting the rope, lightly burn the ends with a lighter or match to avoid unraveling. *Probable life is not a warranty by Premier. Why not? Because we know that longevity is highly dependent upon, but not limited to, quality of installation, insulator(s) used, rope tension, animal/wind/snow/ice/vegetation pressure and UV exposure (altitude and climate). An effective reel for winding, unwinding and storing conductors. Less costly to use than other reels. 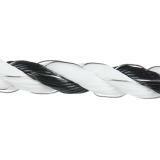 Conductor is inserted into a center spindle that's then tightened to the desired point. 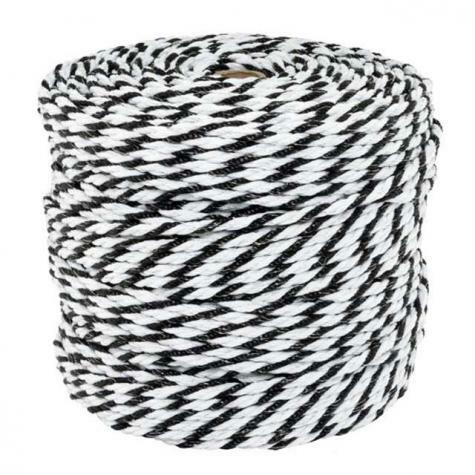 An effective electrical connection for 6mm (1/4") electric fence rope conductors. For insulating and attaching a conductor to a steel T post. Designed to fit between the post studs. Combines wrap around design with a pin lock style face. 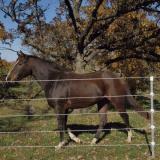 For attaching low-tension conductors to wood line posts. Premier alternative to the common ring insulator. Wider, deeper threads stay in wood posts better. 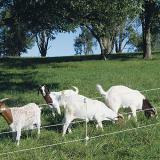 For instant repairs to electric fence and other 4.5mm or 6mm conductors. Separates if a frightened animal charges. Repairs are as easy as replacement of the plastic breakaway button. 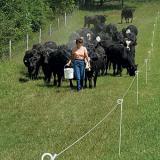 Step-in temporary line post ideal for strip-grazing cattle and sheep. Optional snap-on PigTail Clips allow use of extra conductors. Temporary plastic fence posts with a steel spike. 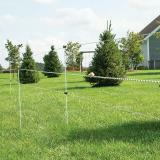 Use for extra support (corner support also) in electric netting and as line posts for temporary fences. This step-in post has a special black ball top with a "harp" clip for holding rope/twine/tape as well as netting twine. Number of reviews: 28 customers reviewed this product. Recommended: 28 out of 28 said they would recommend this product to a friend. The thickness of this rope makes it very handy in a horse fence. 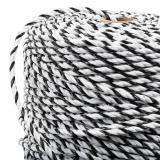 It is very visible and like the 4.5 rope, easy to handle when installing. Using a reel when storing this conductor helps eliminate any tangle related headaches. Works very well. Thank you! 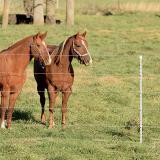 I purchased this product to divide a large field into several paddocks for my horses. It was simple to install and I was able to get it nice and tight without any special tools or a lot of strength. It’s been up for a couple of weeks now, horses respect it and it is safe for them. I expect that this will last at least several years, I was pleasantly surprised by how well made/durable it seems to be. Would recommend and purchase again. IntelliRope 6 is not only stout, it withstands animals running through it occasionally! It's heavy enough to be strong, the black AND white make it easy for the animals (cattle and horses) to see it in both snow conditions and against a grass/soil background (some competitors have orange/white. Not sure animals see orange as well as the black). I've used it for YEARS for cattle and horses. This electric rope is very easy to string and we finished roping off a new pasture in just a few hours. Our animals respect it and we never worry about it not carrying a charge. We've had a tree and a deer hit the rope and knock it down. No damage done to the rope at all and we put it right back up. It's easy to see and shows at night too. This is much better rope than what they sell in our local feed store. Fast and easy to use. Seems to hold up well.